Honey is a natural food produced by bees. It is a gift of nature for mankind, and it is a rich source of nutrients for health. Also, honey is an ingredient in many medicinal preparations. Today, beekeeping is a major industry, and many people have taken it up as a hobby. A beekeeper hat is a must for protection from bee attacks. Beekeeping involves caring for bees and regular maintenance of beehives. While maintaining beehives, the beekeeper is prone to bee stings on the face, head or neck. Protective gear such as a beekeeper hat with veils provides protection from the bee sting. What Is A Beekeeper Hat? Which Protective Gear is Ideal? A beekeeper hat is a round or square hat with an attached veil around it. The veil, made up of synthetic or cotton mesh covers the face, neck, shoulders and other areas of the body. If worn, this gives protection against bee stings. The bees flying around your head are usually harmless, and they are too busy doing their routine job. Although there is no reason to panic or fear the bees flying around you, to be on the safer side, wear a hat and veil that can protect you from a bee sting on the head, neck or face. Several models of beekeeper hat are available in the market, and you can buy them online or from a beekeepers gadget store near you. Before buying, ensure that the item is of high quality, affordable and suits your needs. We reviewed the following beekeeper hats that highlight the product features, price, and other details. The hat from Goodland Bee Supply, made up of natural cotton, comes in medium and large sizes. It is ideal for professional beekeepers, and it offers the best protection from bees during maintenance of beehives. Excellent design with lightweight, protective fabric. Material: Glass Fiber With Fire Proof Coating. Fits fine to 6 3/8 to 7 3/8 ball beekeeper cap sizes. The straw hat is sturdy and keeps the veil in position. The elastic straps keep the hat and veil securely in position. The actual straw hat is large and sturdy. It keeps the veil away from the head. The veil is of an excellent quality that offers proper visibility. The elastic straps keep the veil securely in position. This may overstretch requiring you to replace them. If well maintained, this hat with veil can last long. The hat is made up of straw, a natural product. Good visibility through the veil. The straw hat may wear out fast. Elastic straps may lose elasticity in due course and may require replacement. If you are looking for an affordable beekeeper hat, the Beekeeper Hat Veil by Goodland Bee Supply is a good option. Amazon sells it for around $19.80 with free shipping and applicable return policy. This quality product from Novo comes with a woven straw hat with thickening and encryption veil. It is one of the best beekeeper protection products. It enables you to protect your face from bee stings while maintaining beehives. This hat is ideal for adults. The veil is black in front of the face and wheat-colored on other parts. Offers the best protection from bee stings. You can use it with beekeeping protective gloves. It offers the best visibility with no block of sight. User-friendly. It is easy to wear and remove. Good protection from bee stings. The veil offers excellent visibility. The straw may wear out soon due to constant use. May not be ideal for youngsters. Not very sturdy due to the natural foundation of product. If you are looking for a quality beekeeper hat at an affordable cost, the Novo Beekeeping Square Hat with Veil is a better choice. Amazon sells it at the cost of around with free shipping, subject to their return policies. Aerated hat with a veil, fencing hood, collapsible mesh, and elastic shoulder strap. Ultra-breathable with 100% synthetic fabric (180 GSM) helps in aeration. Gives a cooling effect in hot weather. The lightweight foam insert provides outstanding protection against bee stings. Its universal fit with an oversized mesh protects your neck and shoulders. The elastic shoulder straps keep the veil securely in position. The universal fit hat with an oversized mesh protects your neck and shoulders. The elastic shoulder straps keep the veil securely in position. It is affordable and of high quality for beekeeping professionals. Aerated veil gives a cooling effect. Elastic straps may lose elasticity requiring frequent replacement. Slightly pricey compared to the other products. If you are looking for a high-quality beekeeper hat for all seasons, Humble Bee 221-ST Aerated Beekeeping veil is the best option. Sold by Amazon at a price of around , it comes with free shipping and applicable return policies. Made up of polycotton veil, it has square hat, foldable mesh, and elastic shoulder straps. It is Medium-weight with 50% cotton / 50% synthetic blend (260 GSM) providing excellent protection against bee stings. Comfortable in most weather. It has a universal fit. The oversized mesh protects your neck and shoulders, plus elastic shoulder straps to keep everything securely in position. Ideal design for both men and women. Made up of durable polycotton veil. Offers excellent protection from a bee attack. Better visibility through the veil. The elastic straps may lose elasticity in the long run and may need replacement. The square shape of hat may not suit some. Relatively expensive than some models. If you are looking for a square hat with durable veil, Humble Bee 212-ST Polycotton Beekeeping Veil is the right choice. Amazon sells it for with free shipping and applicable return policies. This protective gear made up of polyester with wire mesh barrier allows great visibility and protection on all sides from bee attacks. The top opening surrounded by an elastic seal, measuring 6.5" in diameter, fits snugly around your beekeeping hat or helmet. The bottom opening features a drawstring to create a tight closing which measures 12" in diameter when open. The front viewing wire mesh measures 9-1/2”wide and 7” high. The sides of the veil run 11” deep allowing plenty of headspace. Veil made up of durable polyester material. Offers excellent visibility on all sides. The elastic seal fits snugly around the hat. Relatively expensive than other models. The elastic may lose elasticity due to continuous use and may need replacements. Although slightly expensive, this is the best model if you are looking for a durable hat that offers complete protection from a bee attack. Sold by Amazon for around and an applicable return policy applies. This is a premium quality beekeeping veil with round beekeeper hat from Forest Beekeeping Supply. It is a lightweight cotton fabric material with polyester mesh. It provides complete protection against angry bee stings. If you've ever worn a veil and just needed to grab a drink or brush the sweat out of your eyes, this veil is just what you've been looking for. The mesh allows for ventilation and protection. You can easily pull down over the brim of your hat or helmet and no more messing with multiple zippers. You can hand wash and line dry. Secure the veil under your arms and across your chest with two long durable polyester cords. The built-in hat does not require a separate helmet. Like the tie-down veil, this product pull-down beekeeping veil uses long cords to secure the veil around the waist. Veils made from tough polyester bounces back to its original shape if accidentally bent. It doesn't form creasing. Easy to pull down over the brim of your hat or helmet. The mesh allows for ventilation and protection. Does not require a helmet. The veil material is durable and doesn't get torn or wear out. The veil is made up of tough polyester material. The veil can be pulled down over the hat easily. The long cords may get worn out due to frequent use requiring replacements. May have to spend more in the long run. Amazon sells Beekeeper Veil With Round Hat and Pull-down Combo by Forest Beekeeping Supply for $25.95 with free shipping and applicable return policies. This is an excellent pick for the beekeeper. Made of denim, it has a steel ring with two steel locks. The veil offers maximum protection and comfort. Its cowboy hat offers a generous round brim and has a durable mesh at the front and cowboy netting at the back. This ensures cooling even when the weather is hot and unbearable. It is also ideal for those who would like to keep off mosquitoes and other insects while working in the garden, hiking, golfing, or sleeping out in the woods. The veil has elastic loops to allow for a snag fit against the clothing. It also weighs approximately 8.2 ounces, bearable to walk around with. The beekeeper hat has a wide and generous round sturdy brim, black durable mesh at front, and cowboy netting at back and sides to keep you cool. Keep mosquitoes, flies and other insects off your face while working in the garden, sleeping out, hiking, golfing or while strolling around. Elastic arm loops and around the bottom to ensure a secure fit against clothing. 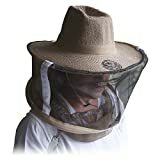 Amazon sells Kocome Beekeeping Veil with Round Cowboy Beekeeper Hat for around with free shipping and return policy. This is the best, affordable model that a beekeeper can have. While choosing a beekeeper veil, look for a model that gives maximum protection, good visibility, and durability. The neck, face, and head are more prone for a bee attack. So, look for a beekeeper hat with a veil that offers adequate protection for head, face, and neck. Also, ensure that the materials used are of good quality and durable. Bee stings on the face can cause severe pain and swelling than on any other part of the body mainly because bees get more time for injecting the venom than in other parts of the body such as the hand from where they are removed quickly by the attacked person. Price: $19.80 with free shipping. Price: Check on Amazon with free shipping. While maintaining beehives and collecting honey, the beekeeper is prone to bee attacks. A beekeeper has to be well-protected against bee attacks by wearing a beekeeper hat. While choosing one, look for a model that offers maximum protection for the face, neck, and shoulders. Ensure that the veil is durable, and it offers excellent visibility.